This Friday (April 4, 2014), join Sir Charles Tupper Secondary School’s Parent Advisory Committee (PAC) for a family-friendly night featuring Disney’s “Frozen”. Popcorn & drink included in admission. Vancouver Public Library Central branch, Toy Jungle, the Granville Island Toy Company (Main Street), STRATEGIES Games and Hobbies, North Vancouver District Public Library, Magic Stronghold Games, K-Max Games and Videos, Geeks and Gamers, Drexoll Games, Curious GameCentral, Board Game Warriors. International TableTop Day is a celebration for all the fans of tabletop gaming. A single day where the whole world is brought together in a common purpose of spending time together and having fun. We hope you find the resources you need — to connect new fans to experienced group organizers, retailers with their community, and publishers with the international community — all in one place. Celebrity guests, Cake Boss Buddy Valastro, Jillian & Todd from "Love it or List", Mike Holmes, Chef Hidekazu Tojo, Canadian Olympic athletes, NHL Alumni. Also in attendance will be Canada's first Iron Chef America winner, Rob Feenie, hunting personalities Eva Shockey & Cody Robbins as well as BMX riders Mike Varga & Drew Bezanson. Bring your kids to meet Emmet from the LEGO® movie and Barbie® between 11:00 AM - 3:00 PM. Join us this Saturday April 5, 2014 to celebrate the arrival of PappaRoti in Canada! Between 10am to 12pm and 5pm to 6pm we'd like to invite you to try our famous and iconic caramel coffee buns. Be sure to hashtag #FreeCoffeeTreat and share your PappaRoti experience to get a chance to win a gift card to spend at our café! We are located at 1505 Robson Street in downtown Vancouver (Corner of Robson & Nicola). Soak in the wonderful Japanese festival atmosphere and enjoy delicious Japanese food and sake, cultural performances, arts and crafts and learn about Japanese culture and business. Enjoy taiko drumming, martial arts, koto (Japanese harp), dance and singing performances. Participate in a tea ceremony, or learn about ikebana (flower arranging), origami (paper folding), haiku or calligraphy and try getting dressed in an authentic yukata. Arts & crafts, raffles, home baking, specialty food items, delicious Russion food, entertainment. Free raffle ticket with $2 admission. Join Purdys Chocolatier & Blenz Coffee and discover how pairing chocolate and coffee can reveal hidden flavours and enhance your tasting experience! Paring sessions will take place in the lower level centre court of Aberdeen. Meet at Burrard Skytrain Station, on Burrard on the corner nearest the Hyatt Regency Hotel Presented by Wendy Cutler, Cherry Scout Co-ordinator. 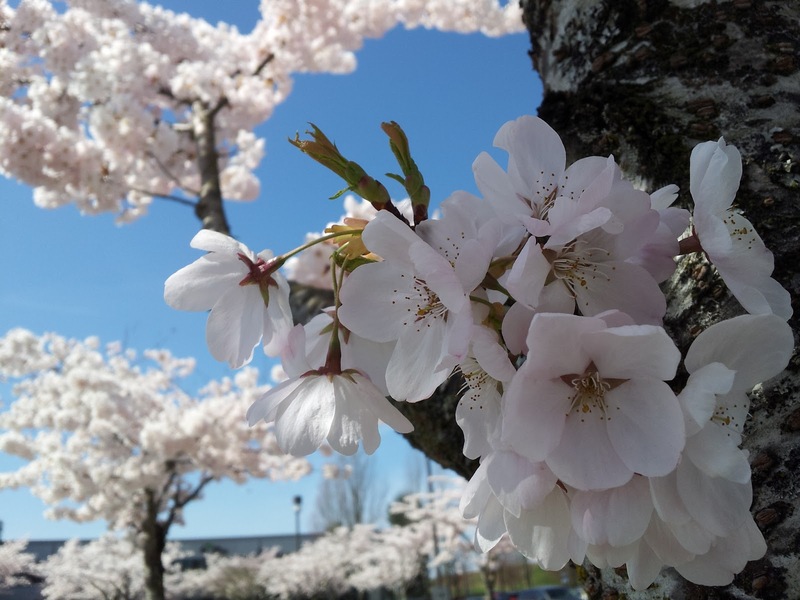 Wendy has been scouting and documenting the tree locations in these neighbourhoods since the festival began, and she has led several sakura tours of the area This should be a walk to view many splendid ‘Akebono’ plantings and other early-blooming cherries. Probably some plums too. This is the longest walk, since we end at the Heronry in Stanley Park, but we’re always near transportation if you want to leave early. RAIN or SHINE. Participate in a pillow fight flash mob. Postcard Show Volume. 4 : Transformation happening on Saturday April 5th, 2014 at The Remington Gallery and Studio from 7-11pm. Come support accessible and affordable art! Include a tour of the garden as part of your Sakura Days experience. Meet at the Guides’ table just inside the Garden. Note that paid garden admission is required for this walk. Presented by VCBF and VanDusen volunteer Anne Eng Anne Eng has been a keen, energetic Cherry Scout almost from the beginning, and is familiar with the cherry trees in VanDusen from her guiding experience there.